← When do you know you are a hopelessly addicted female photographer? The variable aperture - the iris. A new definition for 'Diaphragm Iris' is in the photography glossary. Click to visit the definition. 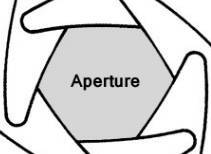 The aperture size regulates the amount of light that you allow into your camera while taking a picture. However, it is the ‘Iris Diaphragm’ mechanism that controls the aperture size. It is a sophisticated mechanism in today’s cameras. In former times the diaphragm was a component of the lens in its own right. Today the iris and the diaphragm are one mechanism which together control aperture size . This entry was posted in Definition, Equipment, Information posting and tagged Aperture, Lens, Light. Bookmark the permalink.